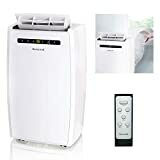 Best Cheap Portable Air Conditioner • The Air Geeks, reviews of air conditioners, dehumidifiers and air purifiers. Does a cheap portable air conditioner require special power outlet? Can I use a portable AC to cool my server room? 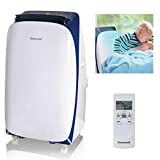 Will a cheap portable air conditioner cool multiple rooms? What is BTU rating and what does it determine? Most portable ACs capture excess moisture as they cool a space. What happens to this water? Is a cheap portable air conditioner noisy? What is the difference between an air conditioner and a portable air cooler? Can I use a portable unit without installing the venting system? Can I bend or extend the hose? Water is leaking from my portable AC. What could be the problem? 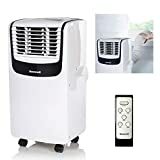 My cheap portable air conditioner does not blow cold air, what could be the problem? Way to go! We prefer the term inexpensive because quality remains a priority. Indeed, long term quality is the best investment you can make as the cost of servicing, and replacing defective filters can offset a one-time sticker price for a low-quality item. Why? The US brand delivers on the promise of an excellent, silent ac unit around the $300 mark – a feat for great air conditioners. Way to go Frigidaire! Why? The portable air conditioner with an excellent value, delivering 10000 BTU in an impressive manner. Why? Our second-to-best AC unit here: an excellent alternative to the best, for a minimal price. Just like most home appliances, portable air conditioners are designed to use standard power outlets. However, you should avoid having all your electronic devices powered from a single outlet. You should check the EER rating of the unit to know its efficiency. As a rule of thumb, the higher the Energy Efficiency Rating, the more power efficient the system is. Other factors that determine the amount of power that a cheap portable air conditioner consumes include humidity, running time, and the model. Yes. A portable AC is a suitable option for cooling server rooms. The best design to use in such spaces is a self-evaporative portable AC. The technology they use negates the need to drain the condensed water manually. If the room lacks a window, you can vent the hot air via a hole to the adjacent room or through a drop ceiling. If the hose is short such that it cannot reach the ceiling, you can use a bench or a table to elevate the system. Portable cooling units are suitable for single rooms. However, high capacity units can cool large spaces. The ability of a portable unit to cool more than one room depends on factors such as its capacity, size of openings between the rooms, the shape of the rooms, and the area covered. Large rooms. For large spaces such as the server rooms, event spaces, and manufacturing facilities, you should use systems with a rating of more than 14,000 BTU. Most of these large rooms are more than 700 square feet. Medium-sized rooms. Most of the rooms in this category are between 350 and 700 square feet and can be large bedrooms or living rooms. Most manufacturers recommend units that have 11,000 to 14,000 BTUs for medium-sized spaces. Small rooms. For rooms that are not more than 300 square feet, use a 7,000 to 10,000 BTU cheap portable air conditioner. The moisture condenses within the unit, and there are three ways to exhaust this water. • Manual removal. Some units come with a bucket for collecting the condensed water. Most of them have an indicator that alerts the user to empty the reservoir when it is full. • Continuous drainage of the captured water. Some units are designed to support continuous drainage of the captured moisture. You just need to attach the hose to the drain port and then direct water into another location. • Self-evaporation. Some models apply self-evaporative technology to exhaust excess water. When using such units, you do not have to worry about the captured water as they evaporate it together with hot air. Noise tolerance varies from one individual to another. A portable AC has a fan and a compressor. These components produce sound when a unit is running. The decibel rating, abbreviated as dB, quantifies the level of noise that a system produces. Most systems in the market produce between 48 dB and 68 dB of noise. Some cheap portable air conditioners have a night mode. When set to this mode, a unit produces minimum noise and it can be used in spaces that demand quietness. Air coolers are also known as a swamp coolers or evaporative coolers. They use water to cool the spaces in which they are installed. These units can bring the temperatures down by about 10 to 20 degrees depending on the surrounding conditions. An air conditioner, on the other hand, uses a coolant and a compressor to cool its immediate environment. Most cheap portable air conditioners are also designed to serve as dehumidifiers. No. You need the venting system as it provides a channel to vent the hot air from the room during the cooling process. These systems come with an exhaust hose whose size is about 5 to 7 feet. To enhance the effectiveness of your cheap portable air conditioner, you should ensure that the unit is installed properly. You should not twist the exhaust pipe for more than 45 degrees as this will reduce the air flow and cause a backward pressure. Lengthening the hose may overheat the portable AC and lowers its efficiency. You should not extend the hose of your portable unit unless you are ready to compromise its performance. If you place your unit on a ground that is not level, there are higher chances that water will flow to one side. Another possible cause of water leakage is damaged or broken casters. Fasten all the casters and replace the damage ones. You should also ensure that the cap of the drain port is fastened to prevent leakages. The PAC can fail to blow cold air due to bends, kinks or obstructions on the exhaust pipe. Also, ensure that the appliance has the space required for unobstructed flow of air. Check if there are some obstructions at the units’ intake and also use the hose that fits the appliance well. You should exhaust the hot air to a space that has ample ventilation.